THIS FEAST IS LEFTOVERS ONLY! 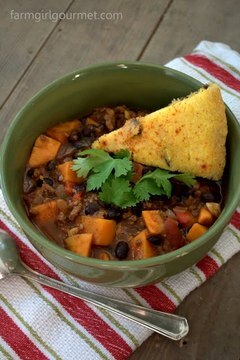 Courtesy of Farm Girl Gourmet this dish rocks my face off (http://www.farmgirlgourmet.com/2011/12/turkey-chili-with-yams-black-beans.html). 3 servings of chili for $10. BAM! You can pick up your leftovers on November 13 between 2 PM and 6 PM. Founder of Feast for Days, interaction designer, married, former college athlete, 4th grade chess club president. Former marketing professional. Now exploring everything else and embracing life along the way. Works at Feast for Days, though still confounded as to where the "On" button is on the stove.